The Clek Oobr is hands down the car seat that kids will prefer out of this bunch. While the others are functional and some even sleek, the Clek Oobr is of its time. It’s hot. It’s fashionable. It inspires awe. And, it’s a pretty good booster as well. 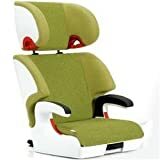 Unlike the other seats in this review series, this seat only functions as a booster, so usually for kids at least 4 years of age. While some suggest using boosters until they reach 4’9″, (tall enough to not slip under the belt), from 8 – 12 years old. Others say that booster use should continue to age 12. This likely will depend on the size of the child and, realistically, their willingness to stay in booster seat. My daughter at age 10, loves her Clek Ollie booster (backless) and enjoys the fact that it sits her up higher in the car. She also like the design and that is a key benefit of the Clek seats for enticing design-oriented kids (you know who you are!) to use the booster. We’ve been using the Clek Oobr with the monkey design pictured here for a few months. My son (6) has two or three Paul Frank shirts and he’s a big fan of the big happy monkey. He likes the fact that this is “his” chair. We like that the seat is super-sturdy. There is no plastic-y feel about it. It is built like a piece of steel, magnesium actually. It was designed by auto seat designers to be super-sturdy and protective. Unfortunately, that makes it very heavy compared to simpler seats. We’re grateful it almost never leaves the back seat. It has a cupholder and reclines slightly but these are not key features, but nice to have. The seat also features a tracked reclining system that reclines the seat 12 degrees, which is a noticeable difference you will appreciate if you have a dozing child for more than a few miles. The seat is also covered with Crypton® fabric. I have no idea what this is made of, but it really works. The other day, my six year old dropped his chocolate ice cream on the seat and onto the floor. I had to get a towel to wipe up the mess which seemed to be all over the place. The only place in the car though, where there was no trace later on, was on the Oobr. We had challenges in installing the Oobr in our Audi wagon using the Latch system to attach the booster securely to the car seat. After a bit of wrestling, we figured out that we needed to put the seat in the full reclining position to expose the latch brackets fully so they can more easily click into the car’s latch system. As I learned from Clek several years ago, the Oobr (and Olli) latch system is a security feature for passengers when the child is not actually in the seat. In the event of an accident, you do not want a 25lb. car seat flying around the car and very few people buckle the seats down when empty. This is a key benefit for the Oobr, since it’s the only booster (without harness straps) that uses the latch system. Beautiful seat with optional Paul Frank monkey design adored by millions of kids, moms and dads. Dissembles for use later as backless booster. Remember to keep kids in booster with back on as long as they will tolerate it for maximum safety. Crypton® fabric really does protect against stains. Exists in lots of exciting colors and Paul Frank designs. This thing weighs over 25 pounds. It’s a heavy seat if you need to move it very often and I wouldn’t recommend it for anyone who is even thinking of being pregnant while using it for another child. Oobr’s LATCH system may be challenging to some to install until you figure it out. It’s not hard, but you can’t just throw it in the backseat. Easily $200 more than other serviceable boosters, the Clek Oobr is certainly not for everyone.